This 82-unit south Macon development, opened in 2003, is limited to those 55 years and older. Section 8 project-based rental assistance is available for many of the residents, where rent is based on 30% of a family’s adjusted income. Amenities: On-site manager and maintenance; community center with exercise and laundry facilities, computer center, activity room; beautiful landscaping with picnic area, gazebos, shuffleboard court, and decorative fencing/security gate. Total Development Cost: $6.6 million. This 40-unit development, opened in 2005, is reserved for special needs families, specifically for homeless persons with a mental health or substance abuse diagnosis. Case management, supportive services, and job training/work readiness is provided on-site by the River Edge Behavioral Health Center, a local mental health services provider. Section 8 project-based rental assistance is provided for all 40 units by MHA. Amenities: On-site manager and maintenance; community center with exercise and laundry facilities, computer center, and activity room; beautiful landscaping with picnic area, tot lot, gazebo, decorative fencing, and security access. TDC: $3,245,133. Awards: 2006 Magnolia Award, Special Needs category. This 106-unit development opened in 2005 with combined tax credit and HOPE VI funding. It is limited to persons age 62 or older. Two of the units are market rate with no income restrictions. The remaining 104 units are public housing assisted, where rent is based on 30% of a family’s monthly adjusted income. Located on 2.2 acres in the Vineville Historic District, 2009 Vineville consists of four mid-rise apartment buildings and a beautifully restored 1930’s-era Greek Revival mansion. The 8,300 sq ft mansion houses rental offices, community space, a fitness center, a computer lab, and offices for various local agencies. Beautiful landscaping includes gazebos, a shuffleboard court, and decorative fencing with security gate. Total Development Cost: $11.8 million. Awards: Historic Macon Foundation; 2005 Magnolia Award for Special Achievement in Affordable Housing. Built on the former Oglethorpe Homes site, this 97-unit mixed-income development opened in March, 2006. 65 units are tax-credit assisted, including 30 public housing units. 32 additional market-rate units have no income or rent restrictions of any kind. Financed with tax credit equity, HOPE VI funds and a grant from the City of Macon, Tattnall Place is the centerpiece of the City’s Beall’s Hill redevelopment program. Families cannot earn more than 60% of the Area Median Income if the units are also tax credit assisted. For tax credit units, maximum incomes range from $23,100 - $35,640. There are no income restrictions for market-rate units. Several floor plans are available including two- and three-story plans with large front porches. Site amenities include a swimming pool and clubhouse with exercise facility, computer center, laundry facilities, and a kitchen. TDC: $11,860,231. Awards: 2006 Magnolia Award, Superior Design Award. Both of these developments are older Section 8-assisted developments that by 2006 were in dire need of rehabilitation. In a total transformation of both properties, each unit was enlarged by some 400 sq ft and now has a second bathroom; the Section 8 rental assistance was preserved to help maintain affordability. Anthony Arms consists of 61 units, 41 of which are HUD-assisted, with rent based on 30% of a family’s adjusted income. Total Development Cost: $7.6 million. Kingston Gardens consists of 100 units, all of which are HUD Section 8-assisted, with rent based on 30% of a family’s adjusted income. Total Development Cost: $12.6 million. Amenities for both properties include: On-site manager/maintenance; newly built community centers with fitness and computer centers, meeting rooms, laundry facilities, library; beautiful landscaping, covered pavilion, and decorative fencing with security gates. Awards: Finalist for DCA’s 2008 Magnolia Award; Kingston Gardens was featured on the cover of the Georgia Department of Community Affairs’ 2009 Qualified Allocation Plan. This 76-unit development in south Macon was built in 1971. It originally consisted of 1, 2, and 3 BR/one bath units, all configured as two-story garden style apartments. Completely gut-rehabbed in 2007 and 2008, Colony West units now have additional square footage and a second bathroom for all of the 2 and 3BR units. HUD rental assistance is available for 30 units; another 27 units have project-based rental assistance from MHA. The tenant’s share of rent for all assisted units is based on 30% of their monthly adjusted income. Disability Connections also provides supportive services for the disabled residents for five of the Colony West units. Amenities: On-site manager/maintenance; new community center with fitness center, meeting rooms, laundry facilities, library and computer center, children’s activity center, and covered pavilion. Supportive services: Van service for residents will soon be available two days a week, and various social/recreational programs. Total Development Cost: $9.2 million. This 61-unit development includes the adaptive reuse of the former Pearl Stephens Elementary School, a beloved Napier Avenue landmark for generations. The school had been vacant for many years and was in a very dilapidated condition. Acquired “just in time” and renovated in 2007 and 2008, Pearl Stephens Village now offers 1 and 2 BR affordable units for seniors 62 and older. The development process included restoring the elementary school to its former beauty as well as adding three, two-story buildings in the rear of the property. Amenities includes on-site management and maintenance, a beautiful auditorium for resident activities, meeting rooms, laundry facilities, a library and computer center, fitness center, a community garden, and a putting green! Van service will soon be available two days a week. 54 of the 61 units receive Section 8 rental assistance from MHA, where rent is based on 30% of monthly adjusted income. Total Development Cost: $10 million. Awards: Historic Macon Preservation Award, Keep Macon-Bibb Beautiful Award. Felton Homes is a 100 unit Public Housing development located on Felton Avenue in Macon, Georgia. The property consists of 50 single-story duplexes on 10.18 acres. It was built in 1941 as housing for military families, converted into public housing in 1955, and “modernized” in the early 1990s. Renovation work began in September 2010 and is a “gut rehab” with a special focus on energy and water saving improvements. Felton Homes will remain a public housing community designed to meet the residents’ needs for safe and affordable housing. 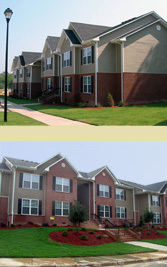 Felton Homes contains a total of 100 units; 14 1-BRs; 60 2-BRs; and 26 3-BRs. Approximately 15% will very be occupied by the elderly or those needing accessible units. The project was built in compliance with Enterprise Green Communities standards specifically modified for this project. Updates include newly oriented entrances with porches, new roof lines, energy efficient windows, and new siding. The project also has solar generated energy and spray foam insulation on the walls and ceilings. The updated interiors offer low-flow plumbing fixtures, energy efficient heating and air conditioning systems, and Energy Star light fixtures and appliances. Bartlett Crossing is a beautiful neighborhood consisting of 2, 3, and 4 bedroom single-family units between Columbus Road and Napier Avenue and adjacent to Lizzie Chapel Baptist Church.